I was fishing Flamingo with Hernan Cortes and his cousin Tony Carnot in one of Flamingo’s many productive shallow water bights on an absolutely gorgeous day this past year. We had just caught a redfish and a snook and were working our way back into the open bay. We were moving along in fifteen inches of water, when I saw a large, shiny tail fin flick and twitter on the surface, heading in our general direction. I started poling as quickly as I quietly could towards the whatever it was. The tail belonged to a massive tarpon that was cruising slowly up into the bight, foraging for food along the way. We had been stalking medium-size redfish, so my anglers had light rods and reels with 15# test braid, 30# fluorocarbon leaders. They were casting shallow-running, weedless, Flappin-shad lures. As we eased closer, we saw that the top tail fin was almost a foot long! It was a monster of a fish! It was translucent silver and it flashed in the bright sun as it flicked in a rhythmic motion back and forth, back and forth. As it hunted nose down along the bottom, puffs of silt and mud boiled up around it. Our hearts were pounding in our chests, as the behemoth creature lazily made its way closer and closer to us. I poled us forward, so that we could cut closer its path and I could get the guys some shots at hooking it. Tony and Hernan made some beautiful casts, running their baits right in front of the tailing fish, trying to entice it to bite. It either didn’t notice the lures in the dirty water or wasn’t interested. The fish was moving into the wind and it was slowly out-pacing us as I pushed us along in the shallow, mud bottom. It was just about out of casting range and now and directly up wind of us.“This is your last shot!” I whispered, as Hernan took one final cast at the departing fish. The cast was perfectly placed, landing just in front of the fish and trailing right in front of its face. Suddenly, the water ERUPTED with an explosion of mud and spray, as the massive fish slammed the lure and bolted towards the mouth of the bight. It began greyhounding in the shallow water at a tremendous and frantic pace. I didn’t think we had a prayer of stopping this fish, as it smoked the reel drag and dumped line from the small spool, but that wasn’t going to stop us from giving it our all! I lowered the engine so the prop was barely in the water and fired it up. “Hold on!” I yelled and I put it in to gear. We started moving forward in pursuit of the fish while Hernan held on for dear life. At this point there were only a few precious feet of backing left on the spool. I couldn’t move the boat very fast at all, because the water was so shallow, but we were beginning to follow at a slow, steady clip in pursuit of the fish. We barely managed to stay with it, as it made its way across the shallow bight. We’d gain line for a while and then the frantic tarpon would take off again, till the silver at the end of the spool of line would show. After about a half hour (which seemed like a lifetime), we started getting a bit more line back and we got into a rhythm with the fish. Suddenly, it changed tactics. It whipped around in a tight arch and shot directly towards the boat. I knew we were in trouble because in that shallow and muddy bottom, we had almost no maneuverability. The fish bulleted back at us and bolted back behind the boat. Unfortunately, it took the line under the engine with it. With a loud “pop” sound, that every fisherman dreads hearing, the line snapped. We were heart-broken! At this point, we needed a break from the intensity of stalking the shallows and needed a change of scene (not to mention the our chaotic battle had undoubtedly spooked the fish on out proximity), so I decided to take us over to a nice, productive bay to do some drift fishing for trout. We worked our way into deeper water and I jumped us up onto a plane. After about fifteen minute of running through the pristine bay, I arrived at the spot and stopped the boat. I turned off the engine, I put out my sea anchor and we began drifting over some nice grass beds in the middle of a basin. We started casting leaded jig heads hooked with Gulp 3′” shrimp tails and popping them off the bottom. It was nice to unwind, after all of the chaos of the previous hour. We casted our jigs while we lamented the one that got away. The trout bite was steady and fun and the action was fun. I was hoping to catch a couple of ladyfish that were small enough to use for live bait at the next spot we were going to. We were relaxed and chatting idly, when Hernan hooked into a little ladyfish about ten inches long. It jumped and somersaulted on the starboard side of the boat as he reeled it in. “That’s a perfect bait size!” I said, “Try to get it into the boat before it gets off.” The three of us were watching intently as the ladyfish leaped frantically out of the water near the transom of the boat. 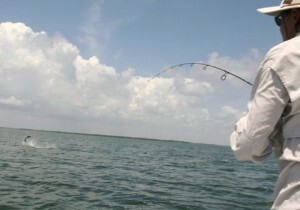 From behind and under it came a monster of a tarpon. It launched itself into the air in pursuit of the ladyfish and smashed it with the force of a freight train. The ladyfish flew into the air, nearly twenty feet, up and over the boat! The tarpon however, was hooked. I screamed, “Take it to the bow of the boat!”, as I started the engine and ran forward to yank the sea anchor out of the water. I could hear the line screaming from the reel and I could see that Hernan’s line was well into the backing on the spool. “Hold on!”, I bellowed as I slammed the boat into gear, hooked a sharp right and followed the fish at a steady clip. Meanwhile this monster was leaping and crashing and ripping line furiously from the reel. The shallow water that had cost us the last big fish did not hamper us this time, as the depth was about five feet. We wanted that fish! Left and right and forward I motored after that tarpon. I could hear Tony’s expensive-looking Leica camera clicking rapidly as he photographed the fight. He was concentrating on trying to get pictures of the massive tarpon while it was airborne. Meanwhile, Hernan was focused on staying upright, reeling and trying to gain as much line on the fish as he could. We would gain on the fish for a while and then watch in frustration as it ripped all the line he had gotten back, out of the reel again. After about an hour (and nearly four miles) of chasing the fish, we finally had it boat-side. We glowed with joy and relief as we paid homage to this fantastic creature that had given such an admirable battle and run for our money. I was able to get the jig out of its massive jaw and release it unharmed to fight another day. Hernan was exhausted, but elated. Tony claimed to have gotten some beautiful pictures. I was happy for my anglers and thrilled at the chance to have gotten a little bit of redemption for the one that had gotten the best of us earlier. 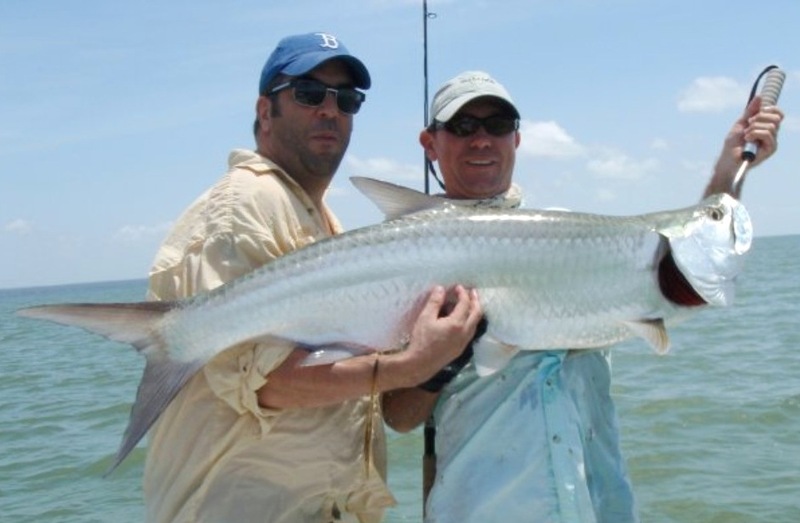 We had been totally out-classed by that beautiful tarpon, but we refused to be beaten.